At 11 years old, Doug Simons began learning about the native plants of Colorado from his mother. His awareness, knowledge and connection to the plant world has only grown stronger through his life and travels across the American continent. His learning and practicing of medicine has taken place in the Western U.S., Mexico, Central and South America. Through these travels he has learned from many indigenous cultures, some of which include the Tarahumara, the Tohono O’Odham, and the Navajo. 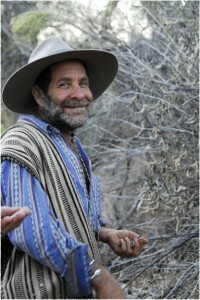 Doug has also gained a vast amount of firsthand knowledge with regards to edible/medicinal plants and primitive skills through his experiences living primitively in the Sonoran Desert and Gila Wilderness of Southern New Mexico for over 20 years. Recently, Doug has been inspired to come out of the wilderness and share this living knowledge. Throughout Doug’s abundant life-experience, he has adopted an incredible lifestyle that is reflected in his teaching. His lessons are expressed through story and firsthand experience. This rare style of teaching is accentuated by his ability to hold space for each student in a positive and fun way as they begin or continue to establish their connection with the plants. All lessons are taught in a hands-on way and are applied whenever possible. When discussing plants, for example, students are not just encouraged to visually identify, but also smell, taste, feel and interact with the plants. Doug believes this creates a deeper connection with them as well as solidifies the learning experience.